An old school platform shooter developed by independent South African studio Free Lives. The game employs a parodic style to resurrect the legend of classic side-scrolling arcade shooters and the cult of movie tough guys from eighties and nineties. 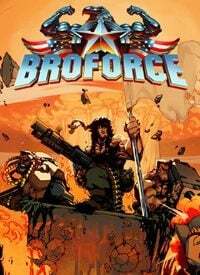 Broforce for PC, PS4 and PSV is a 2D platform shooter that reanimates the legend of classic side-scroll arcade games and indomitable tough guys featured in the film industry of the 1980s and 90s. This game came to life thanks to South African studio Free Lives and Devolver Digital, the publisher of an equally distinctive indie game – Hotline Miami. The game lets you play as the most famous action film heroes of the late 20th century: John Rambo, Texas Ranger, John McClane from the Die Hard franchise, and B. A. Barracus from The A-Team TV series. Because of licensing issues, their names received a ‘bro’ affix, resulting in such combinations as Rambro, Brobocop, or Bronan. Gameplay is as simple as it can be – you travel through a series of locations freeing captives, eliminating bad guys and, from time to time, facing more demanding mega-bosses. You are armed with a main weapon (different for each hero) and grenades. You reach checkpoints when you manage to raise the American flag, and when the mission is complete you fly away on board of a military helicopter, leaving nothing but smouldering ashes behind you. As their inspiration, the game’s authors name classic shooters they grew up with (Contra, Metal Slug) and recent works of such developers as Derek Yu (Spelunky) and Vlambeer (Infinite Swat, Super Crate Box). Not just the game’s mechanics, but the visuals as well refer to the roots of the genre – pixel art graphics reminds of 8-bit classics. It is noteworthy that the game environment is fully destructible, so you can use grenades to open a way into otherwise inaccessible places. Following another modern trend, the game offers full spectrum of multiplayer support. Broforce for PC, PS4 and PSV allows for local co-op as well as online play – in the latter, you can not only cooperate with other players, but also compete with them in Deathmatch mode. On top of that there is a level editor, which lets you design your own levels using the same tools the developers did.